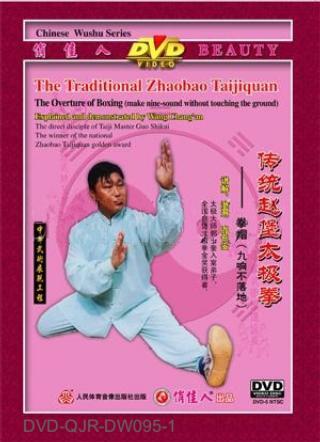 This routine of Traditional Zhaobao Taiji Quan carried on by Taiji grandmaster Guo Shi-kui, was created with the essence of the 72 big-form Zhaobao Taiji Quan. It is the foundation of this routine and was kept secret and never disclosed in the past. It is also called "make nine sounds without touching the ground". These nine sounds refer to the sounds made in the air with the support of a single leg. It requires agile body, fast leg and swift rolling from point to point. When practiced, it is very handsome in a decent spreadout form.